Project obstacles and solutions: In 2013, Subaru of Indiana Automotive (SIA) announced plans to expand their production facilities in Lafayette, Indiana. This expansion was needed to accommodate the manufacturing of the Impreza compact car, among others, by 2016. A major part of this $400 million project was the building of a new paint facility. 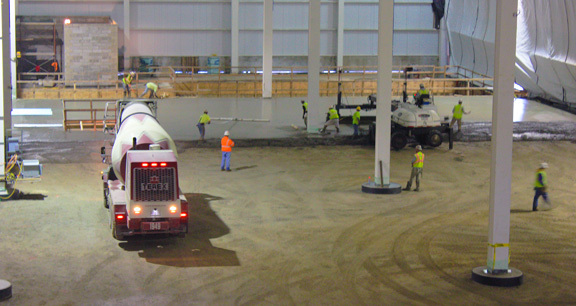 Critical to the facility's operations was the floor construction. SIA needed to be able to place and move heavy equipment throughout the facility. They needed a reinforced concrete floor that would allow them this flexibility. However, the floor was specified to be poured without rebar or welded wire fabric. Devon Industrial Group built all of the floors on this project. They were on a very tight deadline to complete the floors and had brought in a laser screed to level the floors quickly during the finishing process. They needed a concrete solution that would keep their crews moving, but would also meet the SIA specs. IMI designed a mix that was good for expansive industrial floors. It used large, coarse aggregates to prevent curling that can happen in sizable slab-on-grade applications. It was delivered with a 5 inch slump, so it was easy to move. It also used imix XS steel fiber reinforcement in the mix. Typically, imix XS is used to control plastic shrinkage and thermal cracking in concrete. In this case, the steel fiber dosage was increased to 48 lbs per yard to provide extra compressive strength to the floor. IMI supplied over 17,000 yards of concrete for the SIA paint facility expansion project. For more information on imix XS steel fibers, click here.